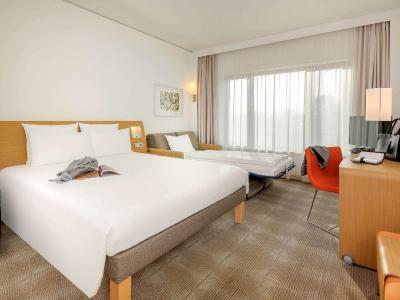 Lock in a great price for Novotel Berlin Am Tiergarten – rated 8.7 by recent guests! Very nice hotel in a perfect location next to the metro and not far from several historical sites that we came to see!! Did not use any facilities other than the room and elavator!! the location was excellent, the breakfast was good. Big rooms, one with a balcony! Great staff! Free fruit! The location was great. Steps from the S Bahn subway. And the staff was excellent. Everyone at the front desk were extremely helpful. Particularly Anika. Great breakfast buffet. Large and quiet room with nice atmosphere, very clean. Right next to Tiergarten stop. Convenient parking garage. Clean. 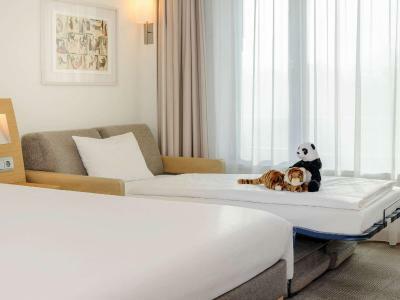 Novotel Berlin Am Tiergarten This rating is a reflection of how the property compares to the industry standard when it comes to price, facilities and services available. It's based on a self-evaluation by the property. Use this rating to help choose your stay! 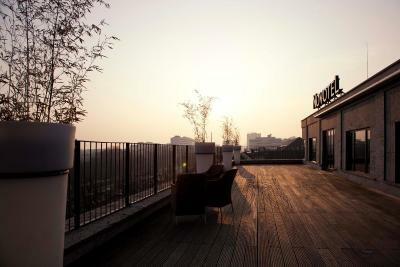 When would you like to stay at Novotel Berlin Am Tiergarten? Public parking is available on site (reservation is not possible) and costs EUR 19 per day. Please state the number and age of accompanying children in advance. Otherwise the hotel cannot guarantee that you get a family room. 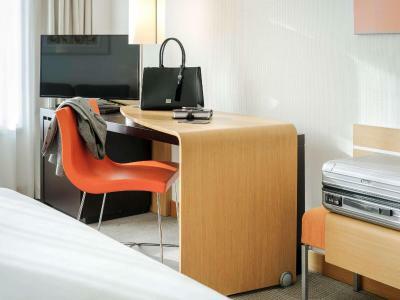 Elegant room including luxury toiletries and free room service and free mini-bar drinks. This triple room has a tumble dryer, cable TV and mini-bar. 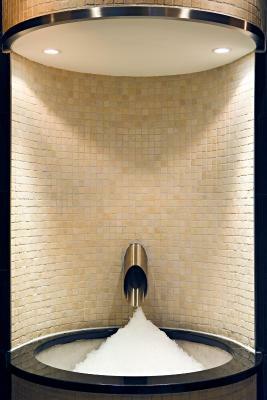 House Rules Novotel Berlin Am Tiergarten takes special requests – add in the next step! 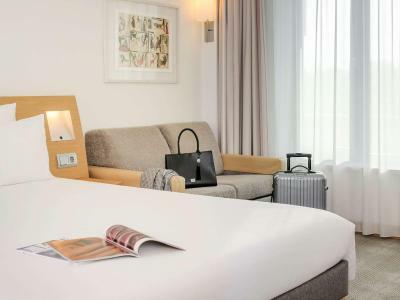 Novotel Berlin Am Tiergarten accepts these cards and reserves the right to temporarily hold an amount prior to arrival. Should you have booked a room including breakfast, children until the age of 5 can have breakfast free of charge. For children between 6 and 15 years a charge of EUR 3,00 per child and day applies and will have to be paid on site. Guys on a reception were good, but waiters in the bar are lousy. They are so slow and unorganised. For a one drink you wait around 20 minutes. Never seen such a bad service. 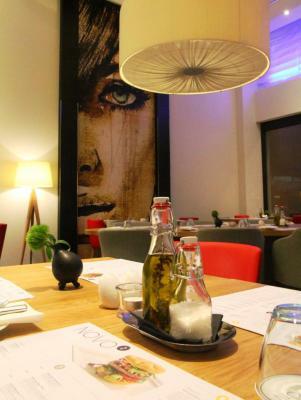 This was not expected, because I was in Novotel Kirchberg in Luxembourg and there, the service was great! Definitely avoid hotel bar!!! Very good breakfest, big room, comfy bed and bathtub! Stay for 2 nights only. Location is good but no restaurants around. Train stop opposite the hotel. Next to beautiful park. 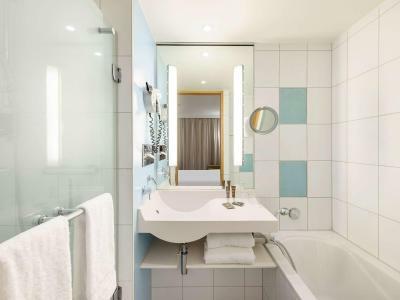 Comfortable and clean room, next to the hotel is S-bahn station - 3 stops to the city centre. We got room 207, which is designed for handicap person. A little bit weird with some emergency red buttons in the room. Don't know if all other rooms are the same. Hotel is clean and quiet. 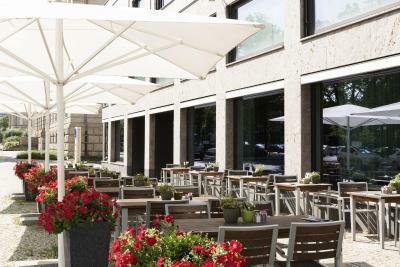 Location is good, close to the Center, nearby S bahn. The location is a bit out of the way, but it is great for closeness next to the park and the zoo. 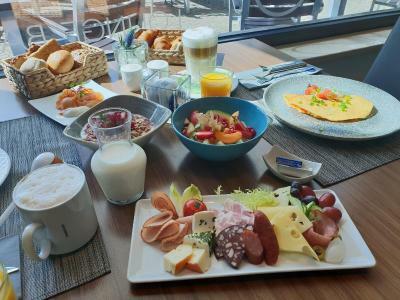 The breakfast was very good with ample choices. My son got sick the last day and the staff was gracious to extend our checkout time so that he could rest until we had to leave for the airport. Overall a pleasant experience. It was all perfeckt staff was so lovley and the hotel was so clean and everything was greeat we will come again. Lack of restaurants within or surrounding the property. The bar food was nice but lacked variety especially for those who don't eat beef . We booked a room for 2 adults and 2 kids with included breakfest. But later we needed to pay seperatly for kids breakfest. Be carefull. I booked a room with a double bed but only got two single bed.I was with my partner!Though i did not complain,i believe this is so important ,the hotel should have got this right .